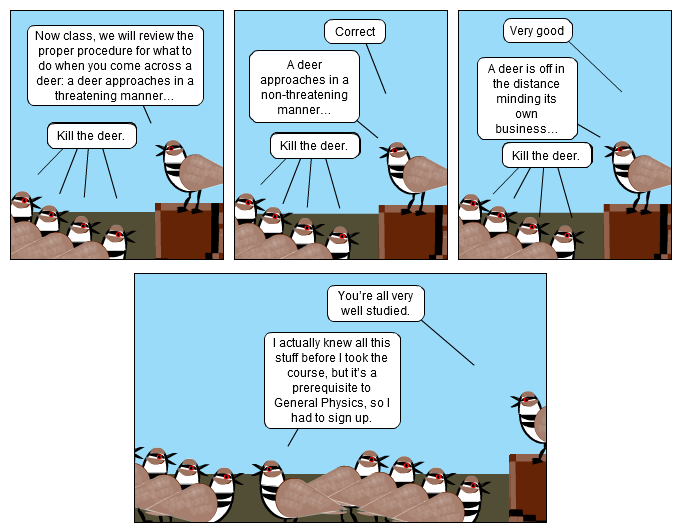 It’s important for understanding the general motivation of the killdeer to know that the killdeer hates deer. If I have, in the past, failed to make this abundantly clear, I apologize for any confusion that may have ensued. You’re all very well studied. I actually knew all this stuff before I took the course, but it’s a prerequisite to General Physics, so I had to sign up. "how many deer does it take to screw in a light bulb?" C'est beau de savoir ! That class was a real gut!